It's been a while since I last wore my bell bottoms. My belly seems to be growing day by day, so I was pleasantly surprised to find that I could still button them up (I'm not so sure that they'll fit me next week!). Since I've been remixing my wardrobe these days, I paired them with my favorite light weight tunic and slouchy bag. The proportions worked, I was comfortable and my outfit had that '70s-ish vibe that I always love. I hope everyone had a great weekend! P.S. - Don't forget to enter my $100 LOFT gift card giveaway if you haven't done so yet! The winner will be announced this Wednesday, August 1st. You look radiant. Congratulations on your pregnancy. This is one of the best periods of you life and I'm talking from my personal experience. love this look, audrey! i'm a huge fan of the classic bell bottoms! Love this look. I just adore my bellbottoms too. They are perfect for any occasion- and that shirt is absolutely fantastic. So cute and cozy. Love that bag :) Happy Monday!! k.... you are the queen of both BF denim AND Bells! lovelove it. LOVE this look. the tunic looks FAB with the bell bottoms! I WOULD NEVER BE ABLE TO PULL THIS LOOK OFF.. YOU INSTEAD DID BRILLIANTLY! This look seems so comfy yet polished, love it! LOVE the obnoxiously flared jeans! I love the pairing of tunic and bell bottoms...I would think it would be too much volume together, but it acutually looks incredible! Really chic and really flattering, your legs look so cute and tiny. omg pregnant!?! whoooooo! congrats girl! you look great as always! That is so cozy and cute! I can't wait for it to cool of so I can wear my bell bottoms! I really love casual daytime outfits like this. Great jeans, a sweater, and a perfect leather bag are all it takes. Such a beautiful look. girl....way to rock those flares!! and with the oversized sweater......niiice!! Ooooh, I love this combination! Comfy and chic and the bag is superbe! 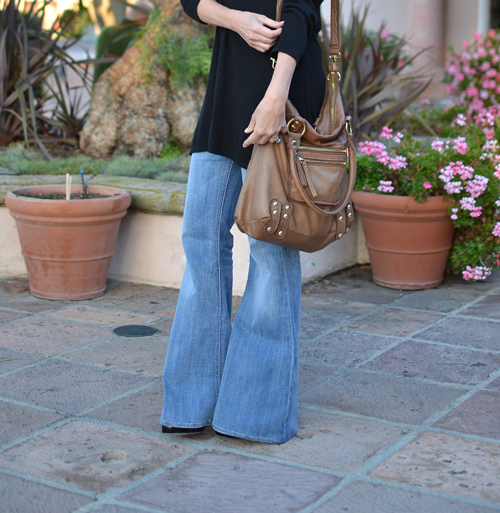 Love the bell bottoms - definitely want to invest in a pair - they look so cute & comfy! I could imagine you as a gorgeous baby bumper....go Audrey!!! I love your outfit. You look casual but chic. Can't wait to see you with a baby bumper. I'm sure it would look good on you. Such a cute look! Loving those jeans! Congratulations on the wonderful news! You look beautiful! That black top looks uber comfy, Audrey! Love the bell-bottoms -- my fave jean ever! ;) You look super chic in a pony!